2017 marks the 15th anniversary of Torchlight Shakespeare! That’s 15 summers of the Fools bringing fun, physical, professional and accessible Shakespeare to your park! Helena loves Demetrius. Demetrius loves Hermia. Hermia loves Lysander. 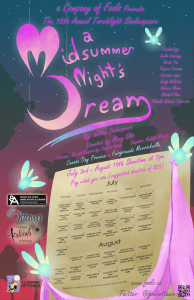 Throw into this mix an enchanted forest, a mischievous fairy, a feuding king and queen and a troupe of terrible wannabe actors and you have a recipe for a hilarious, magical, love-filled summer night. Stay tuned to this page for touring schedule (but you can rest assured we will be in Strathcona Park every Monday, as usual), images and more! As it is our 15th anniversary of Torchlight Shakespeare, this promises to be our biggest production to date!